Q. How do I use a Worldwide Library Catalog (WorldCat) to find books near me? OCLC WorldCat is a worldwide library catalog, which allows you to find the nearest copy of a book. This catalog holds millions of resources around the world. Most widely published books can be found this way, though occasionally rare books are not held by member libraries. This can be especially useful for online students or those studying at extended campuses. 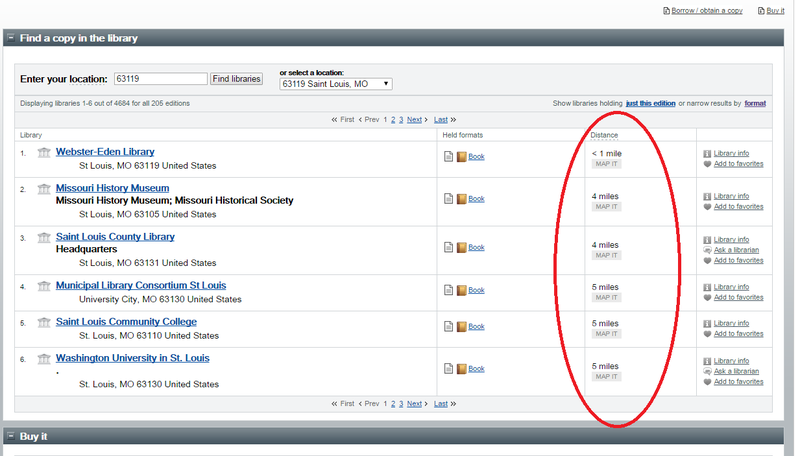 When you search WorldCat, it uses your location to tell you closest libraries to you that have this resource. Visit WorldCat at http://www.worldcat.org. When you enter WorldCat, you will see a search bar. Do a simple keyword search for your book. If the book has a very common title like "Human Resources" or "Chemistry", you might try the advanced search by author or ISBN to narrow your results more easily. Your results will show you the names of libraries near you that have the resource, in order of distance. There is even a feature that leads you to a Google Maps route to the library that you choose to visit. For any questions about WorldCat, please contact the 2nd floor research desk through the Ask a Librarian feature on the library website.